Is your town overrun by criminals up to no good? Then give Inspector Gadget a call, that same hapless detective laden with tricks and tools that he tries to use to restore law and order. With his clever, smart companion at his side (the one who can really take all the credit), he’s well intentioned, funny and incredibly entertaining. Since he’s not actually that good at his job, you can help him set things to right in the game backed with loads of extra features. Place your bet and start spinning today to join Mr Gadget and Penny in their crime fighting adventures. There are 5 reels, 4 rows and 20 paylines in this unique slot game themed after a popular, vintage television show. You can even hear music from the original. Though the inspiration may be retro, all of the extra features that this game includes proves it’s at the forefront of game technology. The lower value symbols are a K, W, A and Q, with the high value symbols represented by objects in keeping with the games theme. You will see a safe, a pair of handcuffs, a police car and a collection of files. A lit bomb ready to explode is the wild and a collection of extra features that add variation when you hear the sound of the phone ringing. These include extra wilds, stacked wilds, the appearance of a brain symbol that increases matches by transforming into other symbols, and the M.A.D. symbol that triggers additional bonus features. If you land at least 3 of these, a spinning wheel will land on 1 of 5 bonus games. Each of these is different, which adds even more variety to this extraordinary game. The include multipliers, choosing from a collection of safes for prizes and free spins. Though inspired by retro pop culture that many players will remember from their childhood days, this is a slick game packed with variety and loads of extra features. It is certainly fitting that a thrilling detective show recreates the thrill and excitement of the chase, and sustained game play will constantly give players plenty of interesting surprises. So help Inspector Gadget and Penny catch their criminals and restore order to the city by playing this great game from Blueprint Gaming. 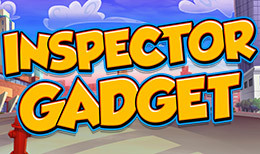 Inspector Gadget really captures the potential of the genre, and it’s loads of fun to boot.